You remember the Duchess of Angoulême from last week, right? She was the only surviving child of Louis XVI and Marie Antoinette who returned to France when the Bourbon monarchy was restored and, as first lady of the family at that time, had use of the magnificent stash of crown jewels. Last week we touched on her influence on the crown ruby parure, but this week our topic is a tiara which has an even stronger association with the Duchess and which bears her name. 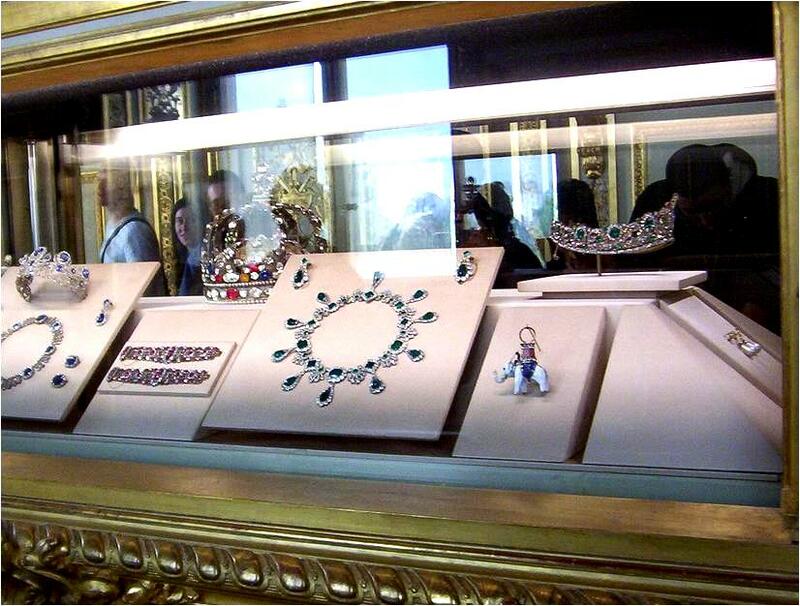 Though made for the Duchess, the tiara was part of the crown jewels and was not her personal property. 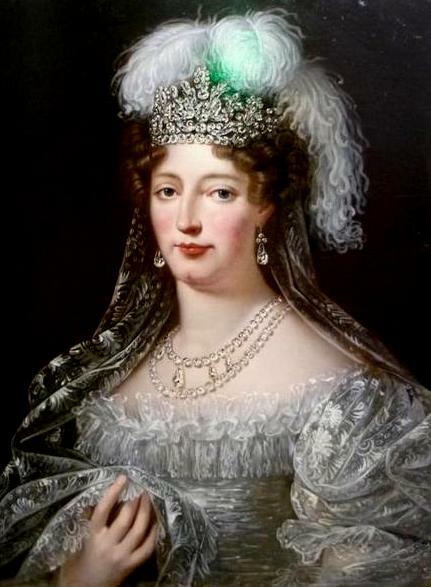 Before she departed for exile in 1830, following the abdication of her father-in-law Charles X and (20 minutes later) the abdication of her own husband from the French throne, she returned the tiara to the treasury. It remained a part of the French crown jewels through various changes of power; in particular, it was said to have been a favorite of Empress Eugénie, who had a special preference for emeralds and used the tiara during the reign of her husband Napoleon III (1853-1870). (Despite this, no representations of the tiara in use by either the Duchess of Angoulême or Empress Eugénie are available, to my knowledge.) Along with the rest of the crown jewels, it was displayed at the third Paris World's Fair in 1878 and at the Louvre in 1884. In 1887, it was sold at auction by the Third Republic along with most of the crown collection. 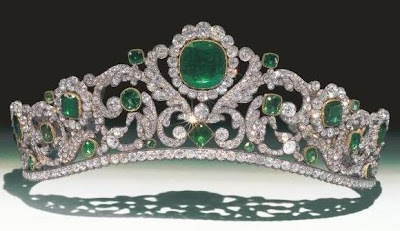 Following the sale, the tiara made its way to Britain, where it surfaces in the 1960s in storage in the vaults of Wartski - where, according to Geoffrey Munn, managing director of Wartski and author of Tiaras: A History of Splendour, it was simply an emerald and diamond tiara, stored without knowledge of its provenance. Once its historical significance was uncovered, it was allowed to be displayed at London's Victoria & Albert Museum from 1982-2002. In 2002, the tiara's anonymous British owner decided it was time to sell. When the tiara went up for sale, the British government interfered and placed a temporary export ban on the diadem to give someone in Britain the opportunity to raise the required funds and keep it in the country. (Interestingly, this process has recently been in the news, as a similar ban has been placed on a gold and peridot set of jewelry with an association to the Prince Regent.) 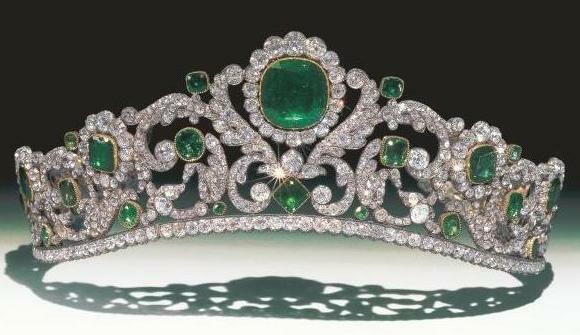 The Duchess of Angoulême's Emerald Tiara is considered by many to be a masterpiece, not only because of its superior design and craftsmanship, but because it is a rare example of those skills that survives in its original form today - most tiaras dating back to this time period have been altered or redesigned since their creation. The rarity of this untouched craftsmanship was cited as a reason for the additional effort to keep it in Britain, but the export ban expired without a successful British purchase. A happy ending was in store, though: the Louvre was able to negotiate a successful agreement and acquired the tiara for their collection. The diadem returned home to France, where it joins other re-acquired items from the French crown jewels on public display. What do you say: masterpiece, or not?